On this page we are going to take a look at the Bosch Indego Robot Lawn Mower from the power tool giant. This very well priced robot lawn mower has unique features that set it apart from its competitors. Sit back and enjoy a perfectly cut lawn all year round with no work at all. 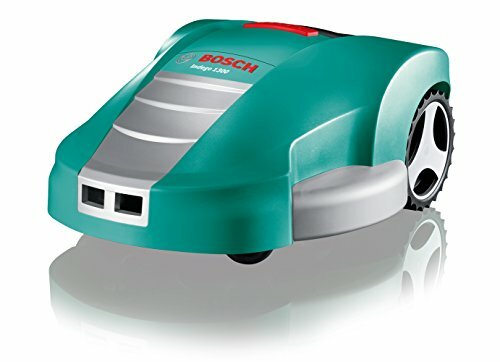 The first thing to notice about the Bosch Indego is that it is capable of cutting very large lawn areas of up 1000 metres square at a price range usually associated with the models that cut smaller lawns. This is a great piece of robot engineering with a quick cut time and an organised approach to cutting. All you need to do is program the Indego to let it know when you want it to cut and you are away. Handling steep slopes and gardens from small to large this is a great model. A great product with a lot of pros that can improve your garden by many times. Below are just a few of the pros. Regular lawn cutting with no work. Cuts small to large lawn areas. There are a few cons but nothing that will stop it working amazingly well. Will not go up and down steps. Installation is nice and easy, the amount of time it will take to set up will depend on the size of your lawn and the complexity of the objects that need to be mowed around. The Indego is guided by a perimeter wire that is pegged into the ground, this limits where the mower can cut and also sections off borders and trees. The perimeter wire and the pegs are included in the box and should be plenty to cover the maximum size 1,300 square metre lawn. Once you have set up the wire you just need to place the Indego on the charge station and choose the cut days and times then let it go. Once it is running it will cut the lawn at the times you have scheduled coming back for a recharge when it needs it. This is a great value for money robot mower. The lawn size that it can cover is very large for the price so very good value for those of us with bigger gardens. The features are what you would expect to see on a higher spec mower as well with the organised cutting patterns and ability to deal with slopes of up to 35 percent. A really good buy that can replace hours of lawn cutting and maybe even replace an expensive gardener for the large lawn owner. A great value from a company with a brilliant reputation. Safety is the first thing that springs to mind when considering buying a mower than trundles around the garden on its own, especially if you have children or pets that use the garden regularly. Bosch have incorporated many great safety features which means the Indego can work around family life absolutely safely. The sensors will immediately cut out the blade if the Indego is lifted up and tilts over. There is also a PIN code that needs to be entered if you want to use the Indego. It will only cut at the scheduled times unless you have the PIN. The schedule can be set to the early hours of the morning or late at night so that the lawn is being cut at a time when no one will be using the lawn. The features of this mower are pretty impressive and definitely worth looking at as it will tackle some lawns that other won’t. The motor and blades are powered by an efficient electric motor and lithium battery that are very cheap to run and an efficient way of cutting your lawn. The Indego will charge the battery on its own, a sensor will let it know when it requires a charge and it will trundle back to the base station to charge before heading back out to cut the lawn where it left off. The Indego is one of the only robot mowers that has an organised cutting pattern using the Logicut technology. It will map out your lawn and systematically cut it in areas meaning that it does not keep going over the same area twice. The speed that it cuts the lawn is up to three times quicker than other robot lawn mowers. A really great feature of you have a bigger lawn. The Bosch Indego Robotic Mower can cope with mowing slopes of up to 35 percent. This is a pretty steep slope and will make some really awkward bits of the garden easy to mow. It would be difficult to push a mower up a slope this steep so a great feature for any lawns that are on a slope. As the Indego will be cutting very regularly it will mulch the grass cutting rather then leave them on your lawn to pick up. The cuttings are chopped up into a fine dust which is then dropped onto the lawn which settle on the earth under the lawn. This creates no mess and also fertilises your lawn giving you a greener and healthier lawn at the same time. Unless you are mowing very regularly with a conventional mower you will not be able to achieve the same result. The Indego is protected from theft by two features. Firstly there is the PIN code, once it has been lifted off the charge station it will not be able to be used again without entering the PIN code. The second is an alarm that will sound if it is lifted off the charge station which is enough to deter any would be thieves. The biggest deterrent of all is that the mower is very quiet and will mow when nobody is around so will not get noticed. Sit back and relax while the Bosch Indego gets on with job of cutting the lawn quietly. It is not silent but you will hardly notice the small amount of noise it makes, nothing like the endless drone of a petrol mower. The Bosch Indego is a great buy, it cuts a large lawn area for the price and will give you a pristine lawn all year round without any cutting. If you have a busy life and other stuff to be getting on with this will really change the way you look at your garden. The features are good with a programmable cutting schedule and an organised mapping of your lawn for a quicker cut. The Bosch Indego is a great Robot Mower that is a great purchase.